Superbowl has always been one of our favorite holidays. Yes, it’s like a holiday in our home. Filled with cheesy-beefy nachos, chicken wings, hot dogs, burgers…you name it, we had it! I can just feel my arteries cringe when I think about it! Yuck! This year was going to be the first of its kind. Sounds less then appetizing but I was determined to make it delicious, healthy and guilt free! My parents would be over and I didn’t want anyone to feel deprived. 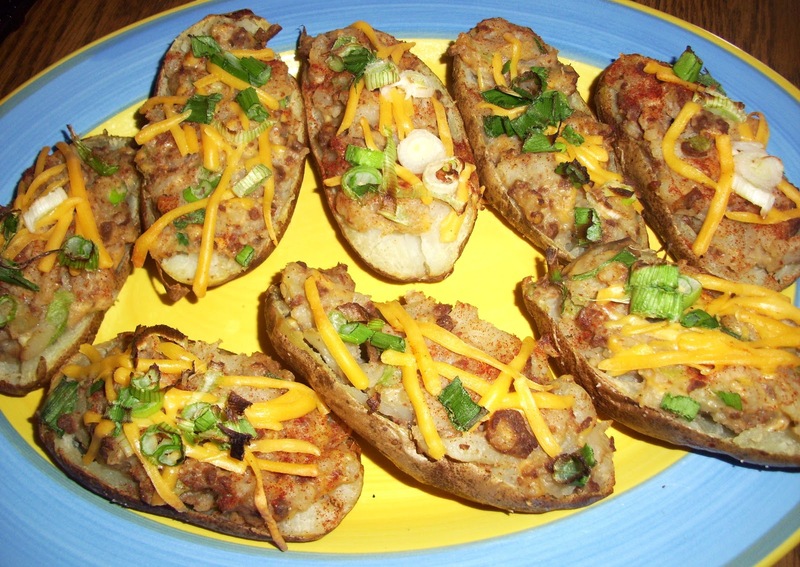 One of my friends had mentioned to me that they were making potato skins for their big day. This inspired me to make my own Vegan version for ours. I chose these for “kickoff” and boy did they do a vanishing act! So good that you would never guess they were Vegan! Low in fat and calories in comparison to your regular greasy skins. Plus, they have a healthy amount of protein per serving to boot! 1 Preheat oven to 375 degrees. Wash and scrub potatoes with produce brush, dry and pierce 4 to 5 times with a fork. 2 Place potatoes directly onto the rack in the oven and cook for 1 hour. Until skins are crispy and potatoes are cooked through. 3 Remove potatoes from the oven (leave the oven on! )and allow to cool enough to handle. Slice in half and scoop out all but 1/2 inch of potato and set aside in a seperate bowl. 4 Mash potatoes in the bowl, add soy crumbles, 1/2 the green onion, seasoned salt to taste and 1/2 the soy cheese. Mix well. Microwave for 3 minutes and stir. 5 Distribute filling amongst the potatoes. Pile it high! Top with remaining cheese and green onions. Put potatoes on a cookie sheet and bake in the preheated oven for 10 minutes until cheese is melted on top. Serve warm with Vegan “cheese” sauce, salsa or guacamole. Next Post The Personal Chef?